The extensive menu comprises light lunches and full a la carte dinners, complimented by a comprehensive wine list. Start the day with a sumptuous farmhouse breakfast and refreshing glass of freshly squeezed orange juice, or choose from perfectly cooked grills, succulent choice grade steaks and plump, fresh seafood. The extensive menu also boasts house specialities such as garden salads, game carpaccio starters, vegetarian platters, 'catch of the day' and other seafood, oxtail pot, tremazzinis, snack baskets or fresh cold meats and salads from the deli. 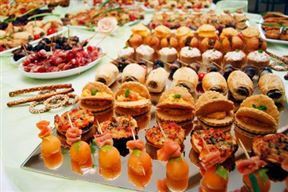 Round off a wonderful meal with a choice of desserts including cheesecake delight and other fresh delicacies from the bakery. •	Turn left and continue for 240 m, your destination will be on the left. We often eat at Lenmore and aways have great meals. We again visited on 31 December 2014 for lunch and once again the meal was great - when we got it . The restaurant was not that busy - maybe six tables - but we had to wait ages for a menu, then another long wait for the order to be taken, more waiting then the milkshakes were served, and then an even longer wait for the meal .I felt sorry for the waitress - and most of the customers remarked on the slow service. Our group of 5 had a great lunch here! The grounds were beautiful. The resident chickens, ducks and birds were lovely to watch. The flowers were in full bloom - we were there in the spring. We all enjoyed our lunch. 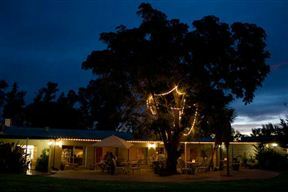 The Lenmore Restaurant is 5.3km from the centre of Addo , the nearest airport 54km (Port Elizabeth Airport).